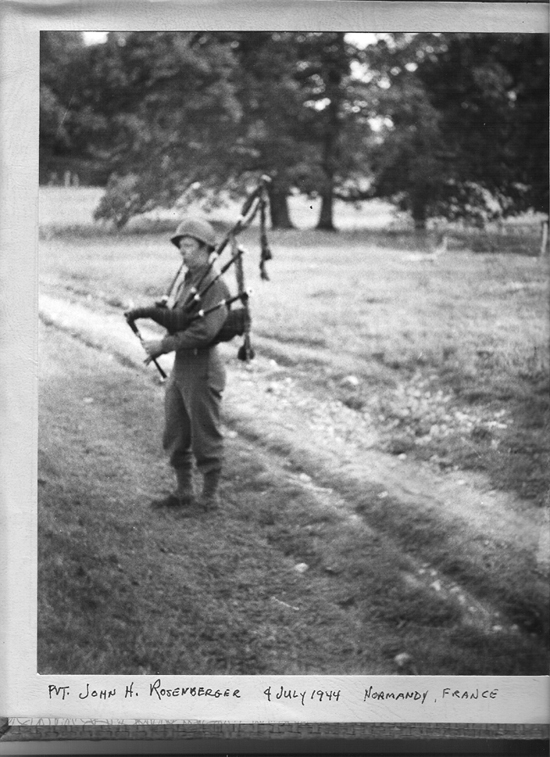 John H. Rosenberger and his father Karl R. Rosenberger formed the Cameron Highlanders Pipe Band in 1946. 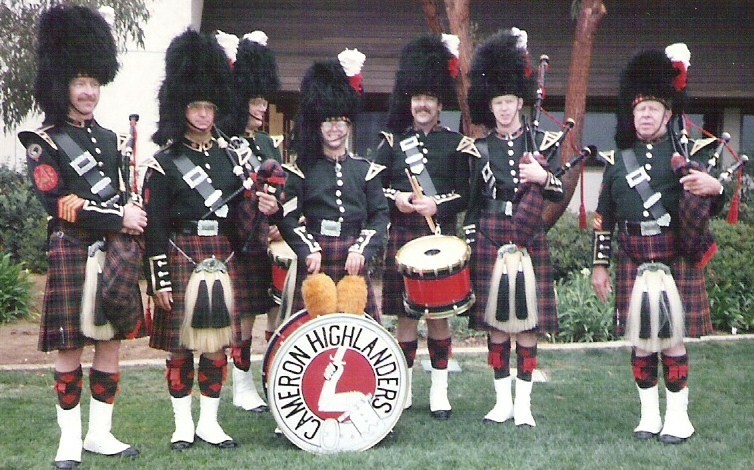 The band was originally the San Diego County Pipe Band and because of the alliance with Clan Cameron of the Order of Scottish Clans, the name was changed to the Cameron Highlanders Pipe Band. 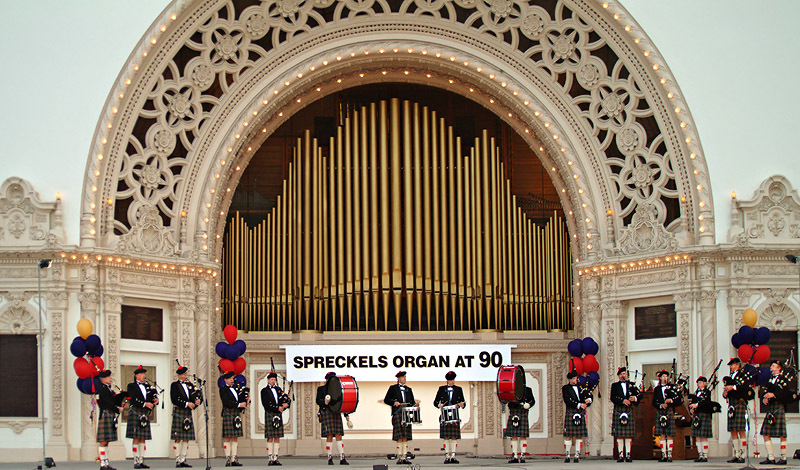 It is now the oldest continually performing pipe band in California and is one of the oldest in the United States. 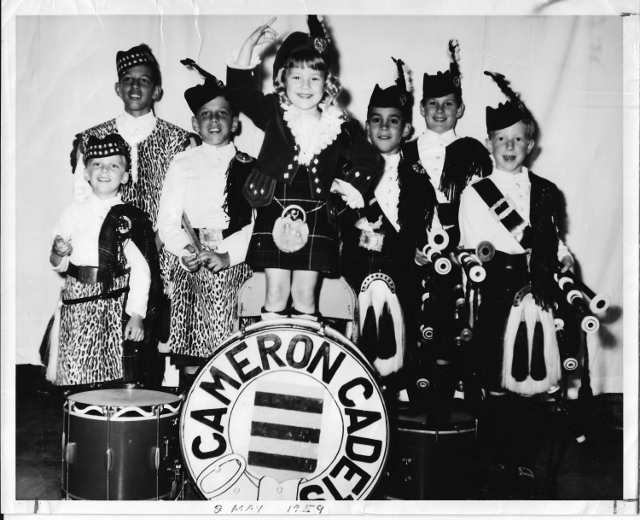 The Cameron Cadets 1959 Left to Right: D/S Malcolm Rosenberger, Bass Drummer Michael Robinson, Side Drummer Bruce Robinson, Dancer Robin Bullock, Piper Cameron Kermott, Piper Buddy Brown, P/M Charlie Rosenberger. 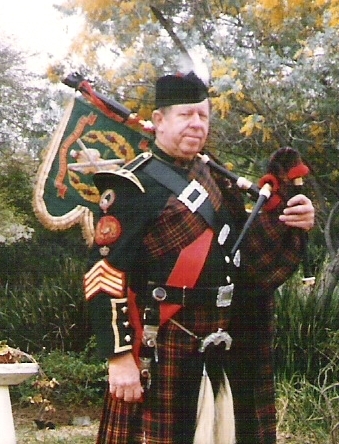 The Cameron Highlanders is now under the leadership of John’s son, Senior Pipe Major Charles R. Rosenberger who has led the competition band since 1970. He is a well respected player throughout the Western United States and has been on the W.U.S.P.B.A judges list for over 35 years. John’s other son Malcolm, led the drum section up until November 2006 at which time he moved from the area. The drum section is now under the leadership of Drum Sergeants Mike Jett and Alexander Grant. Charles learned to play the pipes from his father at the age of seven and was competing at the age of nine. 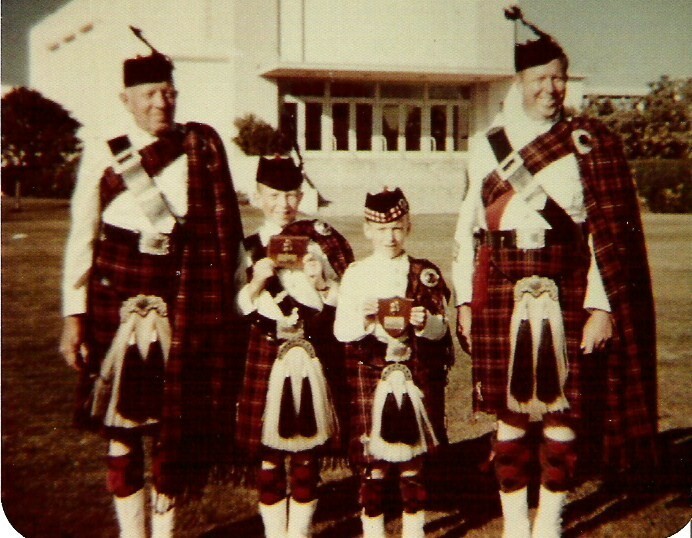 He became the Pipe Major of the Cameron Cadets Pipe Band as seen above in 1959. He won his first prize at the age of ten in the novice class at Petaluma and a second place at Santa Monica. He was moved to the Amateur grade at age ten and won his first aggregate championship at San Diego when he was twelve. He gathered dozens of other prizes and championships over the next seven years including the coveted James McColl trophy for Ceol Mor at Santa Monica. He also took instruction from the late Capt. John B. McClellan. Charles entered the open class at nineteen and collected many more prizes before retiring from the individual ranks to concentrate on the band and other personal endeavors. The band originally wore the Cameron of Erracht tartan, which was the same tartan worn by the Queens Own Cameron Highlanders regiment. In 1956, the Camerons of San Diego were officially recognized by the Queen and were given the privilege of wearing the regimental insignia and buttons. 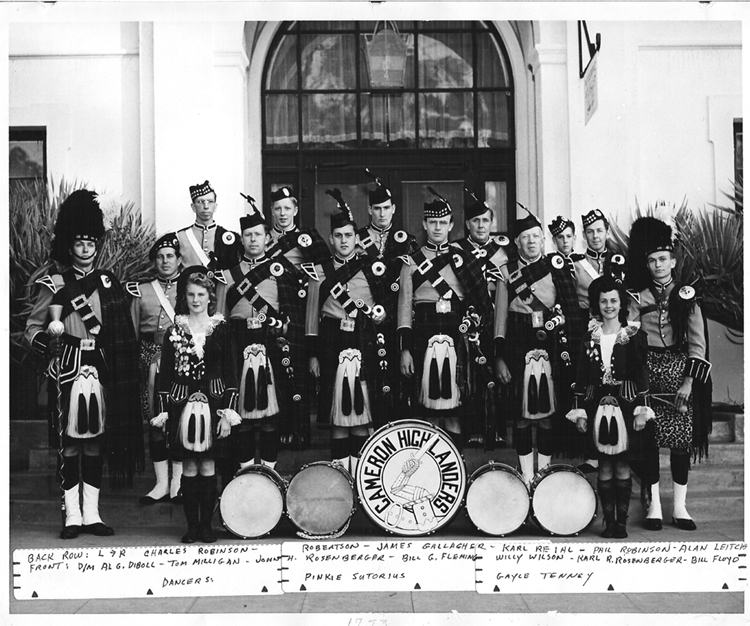 The uniform of the band at that time was the kilt, full plaid, hair sporrans, glenngaries, and military white jackets with Cameron collar badges and the round Queens Own buttons. Later, dark green doublets with gold trim and feather bonnets were added for formal or evening occasions. These uniforms were those worn when the band performed for The Prince of Wales when he visited San Diego during his tour of duty aboard the H.M.S. Jupiter and also several years later when Queen Elizabeth made a visit to San Diego. The uniforms went through another change in the 70’s when it was decided to change the kilt to the Cameron of Erracht old colors. In addition, the full plaids were dropped, as were the feather bonnets. The band now wears the Ancient Cameron kilt with special made black leather sporrans decorated with the Cameron cap badge insignia, black Argyle Jackets and vests and black glenngaries. This uniform is much more adaptable to the warm Southern California climate and gives the band a very formal appearance. In parades, competition and on warmer days the band wears blue dress shirts and black vests. The Cameron Highlanders have been performing over the last seventy two years and have competed almost every year since the early 1950’s. 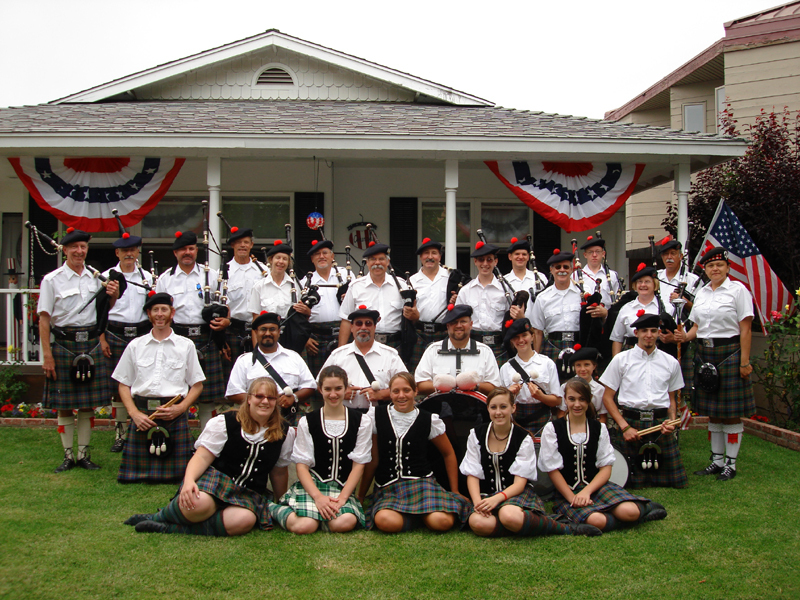 They were one of the original founding members of the Pacific Coast Pipe Band Association, now the Western United States Pipe Band Association. The band first competed as a “B” band and in the 1970’s entered the “A” band ranks. The band did well during these years but dropped out of the competition scene for about five years in the mid seventies. During that time, the P.C.P.B.A. reoriented the association, creating Grade I, II, III, and IV bands to better align the West Coast with Scotland. At that time, the Camerons were placed in grade III. The band has continually been among the prizewinners won numerous championships, including the WUSPBA championships at Reno in 1996. After a sabbatical from the competition field for the 1999 season, the band returned in 2000 to finish 2nd in the WUSPBA standings. For the next several years, the band has perpetually placed in the top three bands in Grade III. In 2005, several of the key members of the band left for other endeavors and the Cameron Grade III band dissolved. The band fielded a Grade IV band at only one competition in 2005, and began a rebuilding process. Charlie worked as an instructor for the band for one season and then took over the position of Pipe Major to help move the Grade IV in the winning direction. During the first year under his leadership the band moved up the prize winners list culminating the season with a 1st and 4th place finish at the Seaside Highland Games in Ventura. After that the band finished every competition in the top four of it’s grade including numerous 1st and 2nd place finishes. In 2010 the Cameron’s formed a Grade V band. Over the next 3 seasons they placed at every competition culminating in winning the Grade V WUSPBA championship for 2013 and 2015. In 2014 the Cameron’s Grade IV moved up to Grade III and finished the season in 4th place in WUSPBA for 2014. All the bands continued their winning ways in 2015 winning the WUSPBA aggregate in Grade 3, tying for first in Grade 4 and winning Grade 5. In 2016 the Grade 3 and Grade 4 bands won the Midwest Champion title in Chicago then went on to compete in the World Championships in Scotland where the Grade 3 band finished 5th in the 3A competition. The Grade 3 repeated as the WUSPBA champions for 2016. After the successful 2016 season the Camerons were moved up to Grade 2. Charlie Rosenberger turned over the leadership of the Grade 2 band to Pipe Major Richard King. Under his leadership the band finished 3rd in WUSPBA for the season and is expected to do even better in 2018. The Camerons currently are fielding a Grade 2 band under the direction of P/M Richard King, a Grade 4 band under the direction of P/M Aaron Cornils and a Grade 5 band with P/M Kathy Mars. Charlie Rosenberger continues as the Senior Pipe Major of the Camerons and is instructing the Grade 4 and 5 bands and still leads the band in local functions while playing with the Grade 4 in competition. The Cameron Highlanders also has a championship highland dancing corps lead for over 30 years by “Head Dancer” Chrissy Ambler. Over the years, the Cameron dancers have accumulated hundreds of individual awards. Four of the band dancers of the past have won the Western U.S. championships. The current band dancers are all prizewinners. 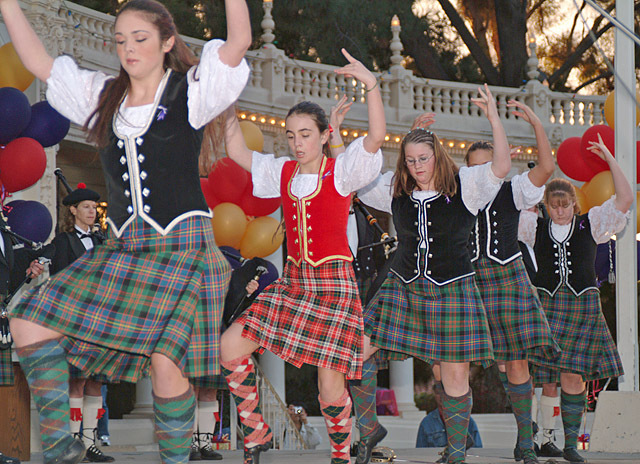 The dancers perform with the band at parades and other functions throughout the year. In addition to competition, the band also performs at other functions including parades, parties, church services, and other public and private events. 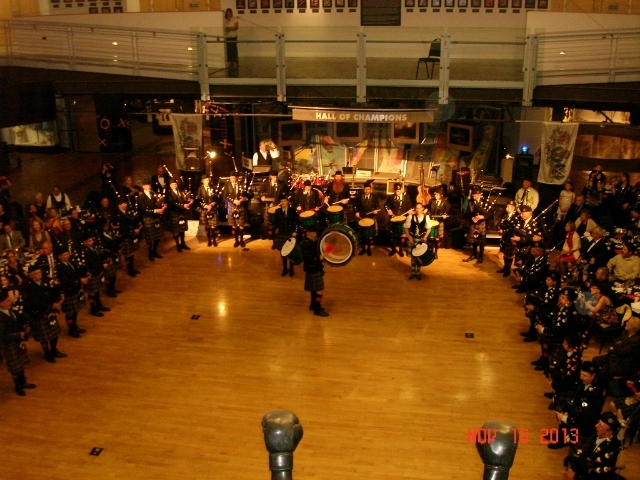 The full band membership currently consists of over sixty pipers, drummers and dancers. Membership is also open to non performing associate members that add another twenty five or more members to the roster. 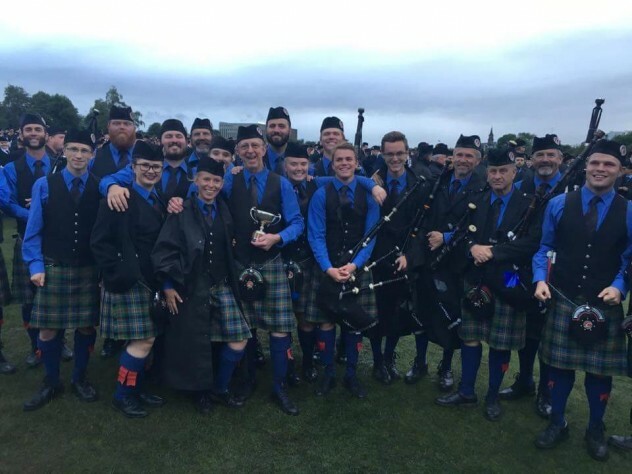 The Cameron Highlanders Pipe Band is dedicated to furthering the art of Bagpipes, drums, dancing, and the Scottish culture and as a 501(c)(3) non-profit organization, free instruction is offered for prospective or interested pipers and drummers. Information about this can be obtained on our Instruction page.